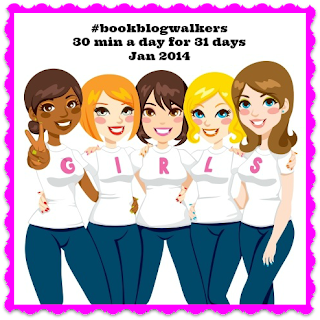 The Book Date : Book Blog Walkers: January. Weekly Check-In One. Book Blog Walkers: January. Weekly Check-In One. This month I decided to join up with The Geeky Blogger walk for January. Its my first time participating. I really needed to get back to walking, I let it go in 2013. I figure January is a good time to start the habit again. It is an easy month for me as I am on holidays from work. Also summer here, so no big weather bombs. I just walked around our neighbourhood. If the weather picks up I will go walk on the beach. I am listening to Julia Quinn's Ten Things I Love About You narrated by Rosalyn Landor as I walk. Yesterday after my walk I went out and bought a new pair of walking shoes. My other ones are fully black and a couple of years old. I want to keep them because I can get away sometimes wearing them with jeans. 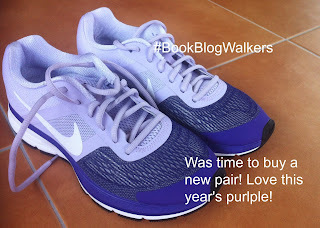 Love the new shoes - I adore purple! And I'm so envious that it's summer where you are (Australia? ), it's cold here and that's forcing me to be inventive with my workouts. I hate the cold and will do everything I can to avoid it. Good luck moving forward this month! New Zealand - er fairly close to Australia! Yes our winters aren't severe but I do not look forward to walking in a biting southerly of the Antarctic when it comes to our turn for winter. Good Luck with your walking goals. It's a bit chilly here today on the Mid-Atlantic Coast (Virginia, USA). Thanks Pat. Yes would not appreciate walking in your weather. I love listening to audios when I'm walking on the treadmill at the gym or outdoors. It's been so cold these past few days, though, that I've just been doing indoor walks using walking dvd's. Hoping next week warms up a bit so I can get to the gym! Yes I was wondering how your snowstorm went. Wait till our winter hits and see who is a wimp! I love the colour! I actually started walking a friend's dog each morning back in about October last year and although I haven't lost any weight I feel a lot better for it. Fresh air is definitely good for you. :-) Good luck with your January walking challenge - it sounds great. Walking a dog would be great motivation. Yes I am not in it to lose weight, although of course that would be icing on the cake! Its really about health and well being I agree.